Could facial exercise be the answer to the age old question -"Can I maintain a youthful appearance?" Must I spend my children's inheritance to stave off Mother Nature's footprints across my face? You can certainly turn back the clock with facial exercise that employs resistance and isometric contractions of the muscles using the thumbs and fingers. This doesn't mean that you will look sixteen or even twenty again but shaving off ten or fifteen years from your appearance with exercise rivals the results of most plastic surgery procedures. The muscles of the face elongate just like the muscles in your arms, thighs and buttocks; in fact, the muscles in the face will have elongated about one-half inch by the time most people have reached the age of 55. The elongation is the result of atrophy of the muscles and gravity. Even though we talk, sing or laugh, the muscles continue to soften and become lax; it's only when the facial muscles are specifically exercised do they begin to plump up and support your skin better. The elongation of facial muscles affects every area of your face. For instance, the "apples" in your upper cheeks may not be positioned prominently, in fact, when a smile is made, rather than seeing fullness high on the cheeks, the muscles may appear flat and midway between the nose and mouth. Beginning a facial exercise program to sculpt and contour the face may seem daunting at first because the movements and positioning feel somewhat awkward. Remember when you first learned to ride a bicycle? It was so scary! But after a few days of lumps and bumps, you were pedaling like you were a pro. 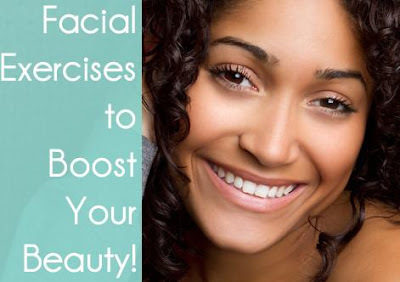 It's the same with facial exercise, once you become familiar with the movements, you will marvel that these simple steps can easily produce a younger looking face. You will want to take beginning photos before you start a facial exercise regimen so that you can track your progress and you will want to update your photos at the end of every third week. In about three weeks friends and colleagues will begin noticing that something is definitely different about you. They may think you have changed your hair in some way or that you are sleeping better but you will know what they're seeing is your pretty face returning.